Synopsis: Childhood friends Chris and Imran celebrate the Millenium as inseparable blood brothers, they are both seven years old. But by 2011 their lives have taken very different paths. One has joined the Army and served in Afghanistan, the other is a potential jihad recruit. They are no longer friends, and there are bitter wounds between them which remain unhealed. Will their childhood bond be strong enough to overcome an extremist plot? In a highly-charged, honest and life affirming story, told in flashback from both Chris and Imran's viewpoint, Alan Gibbon's cleverly explores the very real issue of terrorism that affects everyone today. They start out as childhood friends- at aged 7 they are inseparable. They do everything together- swimming, football, exploring The Wilderness; the empty area of land behind the estate. But slowly, everything starts to fall apart. Chris moves away and makes new friends, Imran doesn’t. Chris gets a job, Imran doesn’t. Chris becomes a soldier, goes out to Afghanistan, and Imran slowly hates him for it. Imran is being radicalised by fellow Muslims, jihadists intent on ruining Britain. Their lives were entwined, then they were apart. They will come together again. An Act of Love starts amiably at first, meandering it’s way through the young lives of Chris and Imran. But the first chapter starts 12 years later: Chris, about to receive a medal, and Imran, on his way to the Barracks in an attempt to prevent a jihadist plot. Alan Gibbons weaves his way through their lives, starting at the end. Shared childhood memories spill out of the pages, interspersed by brief flash forwards to 2011. Slowly, as the book progresses, the gap becomes smaller and smaller, and before long it meets where it started. Alan Gibbons has found an incredibly effective way of telling a long story of friendship, love and hate, almost like a countdown through which the memories tell the story. The lives of Imran and Chris blossom and fade, before re-flowering again and again and again. I have not previously picked up any of Alan Gibbons novels but I am told they are good. Having read An Act of Love, I have cause to believe that they are excellent and well worth reading. Gibbons’ unique way of plotting An Act of Love, by telling it by memories, drives the story forward in the most deliberate and uncanny way, and once finished, you’ll be surprised how quickly the pages fly past. Chris’ perspective is given in first person, while all the other parts of An Act of Love are written in the third person. In the truest sense Gibbons does not employ the “God perspective”. Rather, he is the third person in the room, and knows exactly how everyone feels, and as such even the third person narratives are intimate and insightful into the characters. Beyond the prose, Gibbons tackles the perhaps difficult subject matter of Islam, jihadism, and war. Several viewpoints are put across, all varied perspectives on the same thing. The writing isn’t biased towards one perspective or another; it does not condemn or condone. People may come to read An Act of Love with a narrow view, but they will leave with an insight into the perspectives of others. 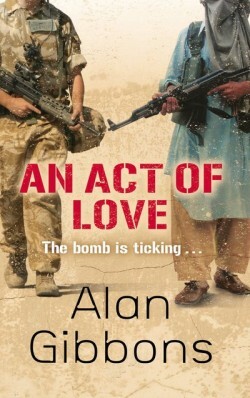 Alan Gibbons uses a range of specialised Islamic terms, and for those who are not familiar with Islam, An Act of Love does not provide a glossary. In most cases, I myself knew what these specialised terms related to. I can thank a BBC documentary about two (white British) brothers, one of whom is radicalised into the Islamic faith, for my rough understanding of basic principles such as Jihad. What did you think about An Act of Love?